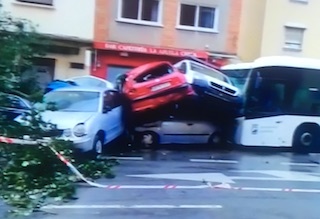 A municipal bus in Málaga ploughed into several parked cars in the centre of Málaga after the driver suffered a heart attack on Friday. The bus swerved off the bus lane, knocking down a couple of trees and heaping up several cars in front of it before coming to a rest, and that was only because a passenger had the presence of mind to pull the driver’s foot of the accelerator. The accident occurred around 08.15h on Calle Héroe de Sostoa and shortly afterward the 112 emergency number started receiving calls from alarmed passersby. All thirteen passengers on board were unharmed, which is more than can be said for their underwear, perhaps. Neither was anybody hurt on the pavement or in the cars, because they were either parked or had managed to avoid being trapped. The 49-year-old driver, who had recently passed a medical check-up organised by the bus company, had been in cardiac arrest for several minutes before the ambulance personnel managed to resuscitate him and stabilise his condition. Fortunately for him, the ambulance that attended the accident was a mobil UVI carrying a doctor and nurse. Once the driver was stabilised the medical personnel attended to the 13 passengers who required calming down more than anything else, whilst a second ambulance transferred the bus driver to hospital. This entry was posted on Sunday, April 7th, 2019 at 7:47 am	and is filed under Andalusia. You can follow any responses to this entry through the RSS 2.0 feed.